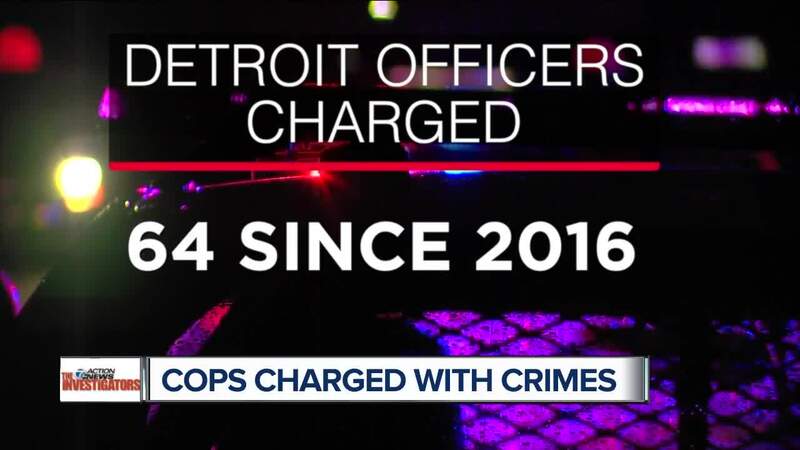 DETROIT (WXYZ) — Sixty-four Detroit police officers have been charged criminally since 2016, a 7 Action News investigation has found. The charges, which include both on and off duty conduct, dwarf similarly sized or larger departments that track charges and include alcohol related offenses, theft, assault and drug trafficking, among others. -Detroit Police officers Anthony Careathers, Jamil Martin, Charles Wills, James Robertson and Marty Tutt who pleaded guilty to accepting bribes from Detroit towing companies, part of a wider federal probe into public corruption. -Officer Edward Hicks, charged with assault over for punching Deonta Stewart in the face multiple times, causing significant injury. Hicks was sentenced to 18 months probation. -Officer Lonnie Wade, charged with the assault of 24-year-old David Bivins while working security for a Detroit Meijer. Wade wrongly suspected Bivins of shoplifting, and cell phone video showed him striking Bivins repeatedly with his baton. Wade pleaded no contest to assault. Bivins, in an interview with 7 Action News, said he grew up wanting to be a police officer, but changed his mind after his encounter with Officer Wade. “After you see how corrupt, something that you idolized is, do you really want to continue doing it?” Bivins said. In 2017, attorney Geoffrey Fieger filed a civil lawsuit against the City of Detroit on Bivins’ behalf. “There’s no explanation that Detroit should be so far disproportionate to other cities with comparable and even larger police forces,” said Fieger. It was hard to find a department with numbers approaching Detroit’s. During the same time period, the Atlanta Police Department reported only 33 officers charged. In San Antonio, the department saw 17 officers charged, as did Dallas—a department with some 600 officers more than Detroit. Las Vegas police report only one officer being criminally charged since 2016, but a spokesman said the department doesn't track off-duty charges. Of departments that track charges against officers, only Baltimore, currently under federal oversight, reported more charges: 76. “Our screening process isn’t what it should be, and our supervision isn’t what it should be,” Fieger said. Chief James Craig doesn’t make an excuse for any of the charges—and points out that most of charged officers were referred to prosecutors by his office. He says it’s a sign that the department is holding itself accountable and stresses that these officers’ alleged conduct doesn’t represent the vast majority of the department. “But it does represent the alleged conduct of 64 cops, and that’s not a small number,” said Channel 7’s Ross Jones. In some instances, Craig says, trauma may have triggered the alleged criminal behavior. Three of the 64 officers, he says, were involved in high-profile shootings, later self-medicated with alcohol and were charged with alcohol-related crimes. Craig said the stress of the job doesn’t excuse their poor judgment, but it might help explain it. Today, David Bivins lawsuit against the city continues. Two years since he was beaten, he said he's yet to receive an apology. "They’re real bad at apologizing," said his attorney, Geoffrey Fieger. "I have yet to have a case where the police who’ve been accused of wrongdoing apologizes."